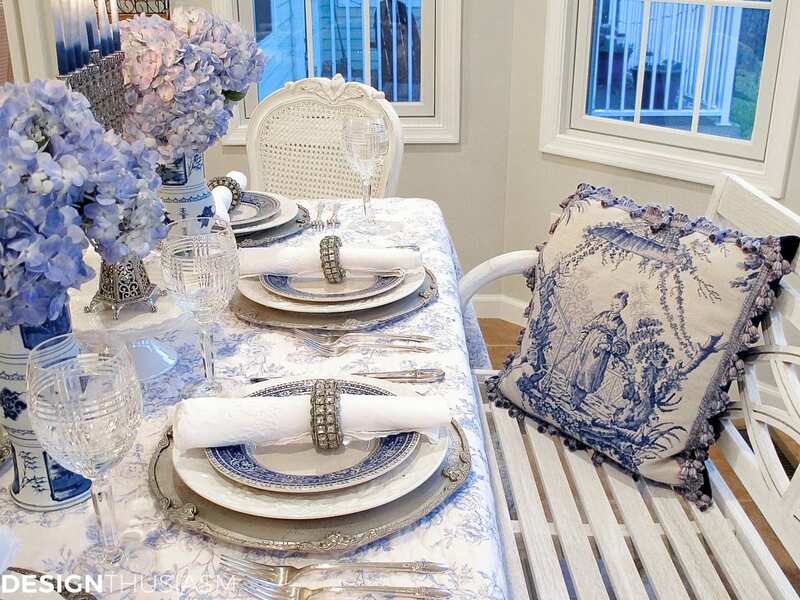 Blue and white is one of the most romantic color palettes for the home. 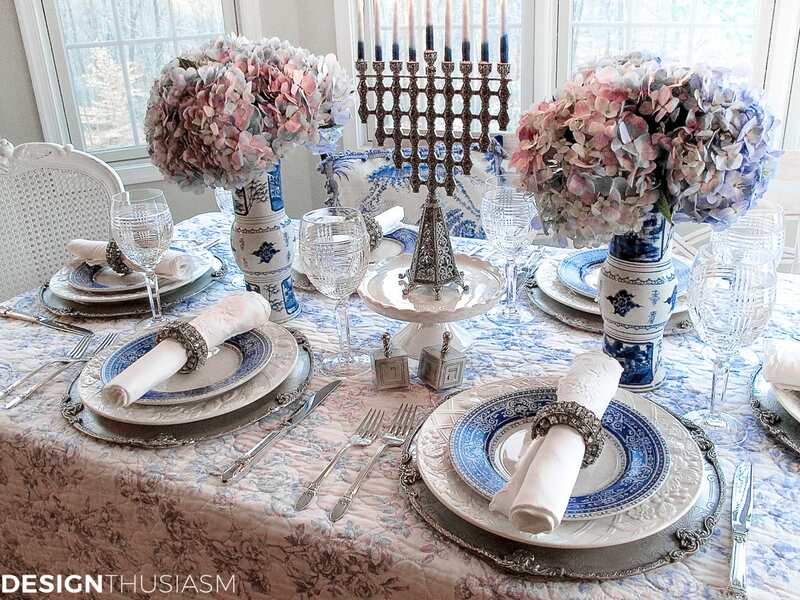 Whether it’s French blue toile, homespun country checks or elegant blue and white chinoiserie, the combination suits many tastes and aesthetic styles. 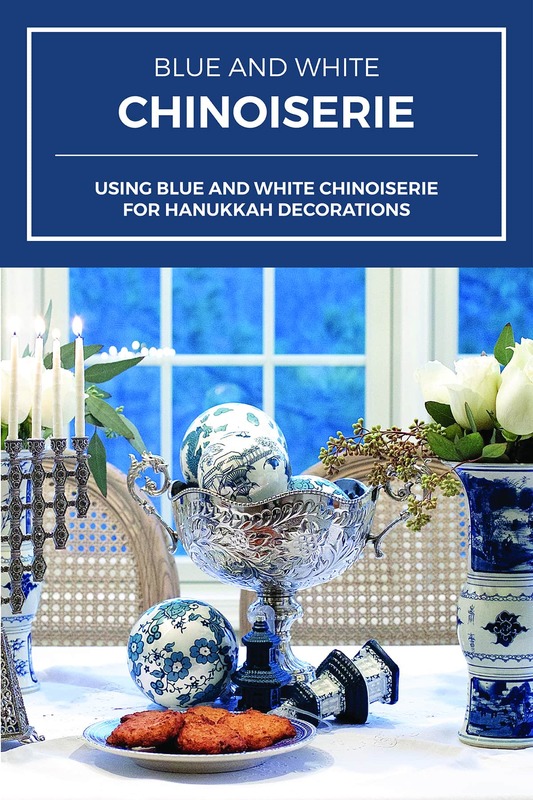 It also happens to be the color way commonly associated with Hanukkah, so when I was styling my table for this festive December holiday, I opted for a French blue and white holiday table setting. 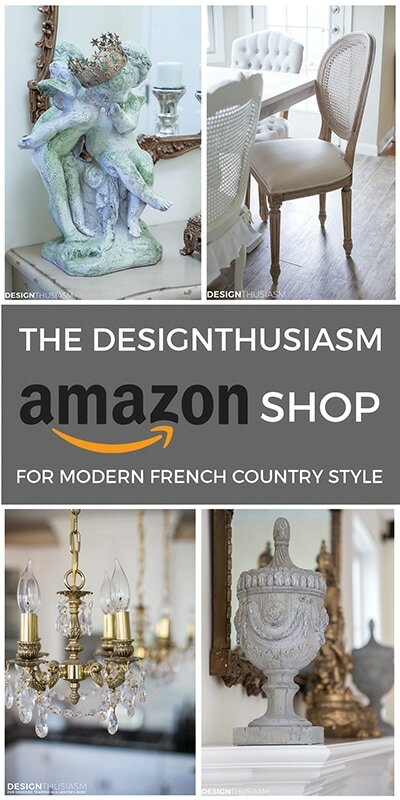 A common theme in all my decorating and styling is a stubborn refusal to abandon my aesthetic taste, so regardless what the occasion is, I generally add to it a French country spin. 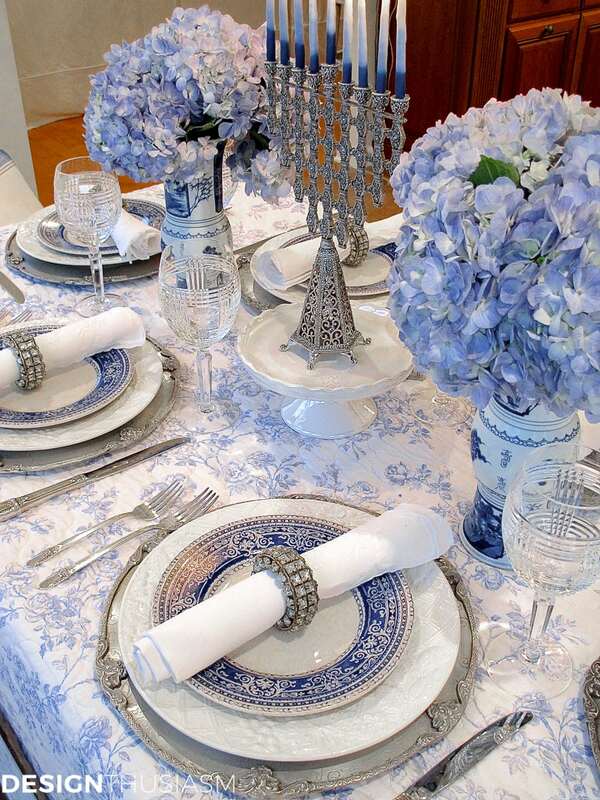 This tablescape is no exception, and while it easily utilizes various Hanukkah imagery, the overall impression is that of a country French picnic. 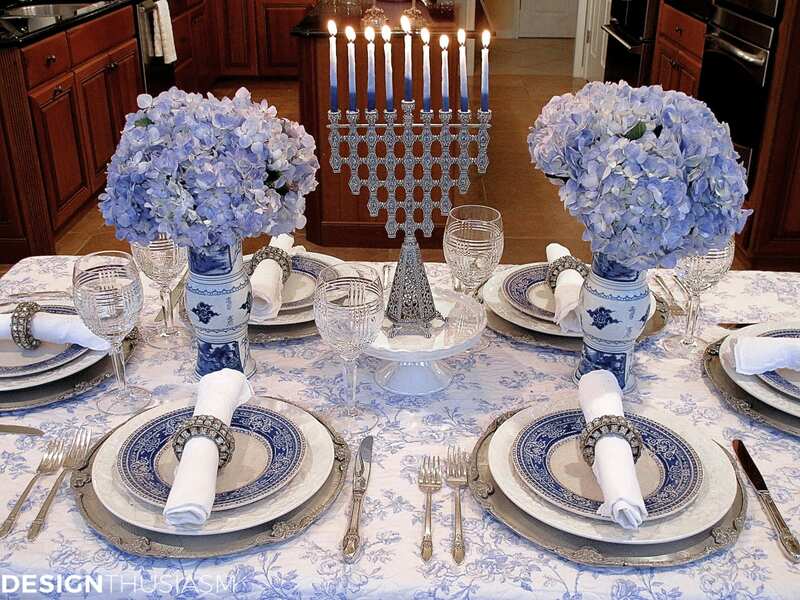 The initial inspiration for this holiday tablescape was the blue Star of David salad plates with a lovely decorative border. They are topped with my everyday cream dinner plates, a versatile dish I use over and and over. 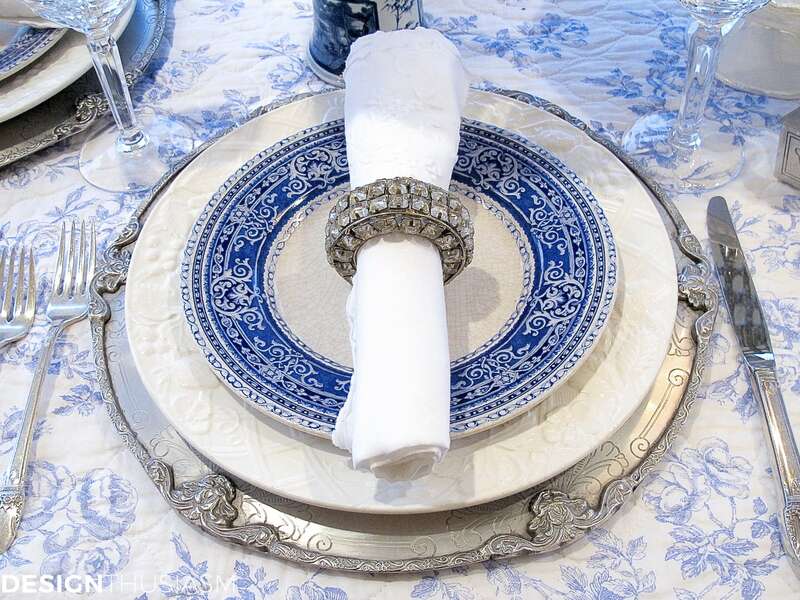 Adding an air of formality to this otherwise casual theme are a few of my favorite tabletop items, including the silver French chargers. 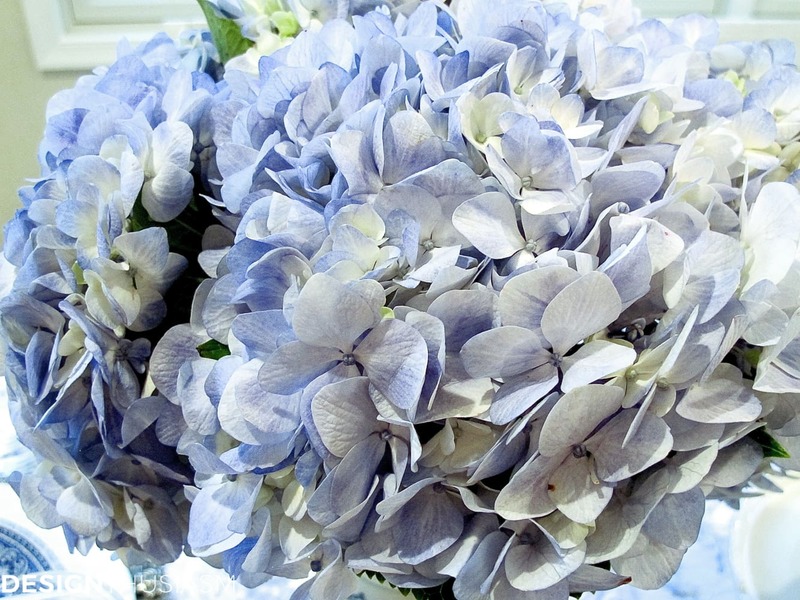 A table setting is not complete without lovely fresh flowers and for this one I used lush blue hydrangeas. Most significant to this holiday and thereby given a place of honor atop a cake plate is the menorah that’s lit with all of its candles. This one is a new one to our family and the addition has been a most special treat. 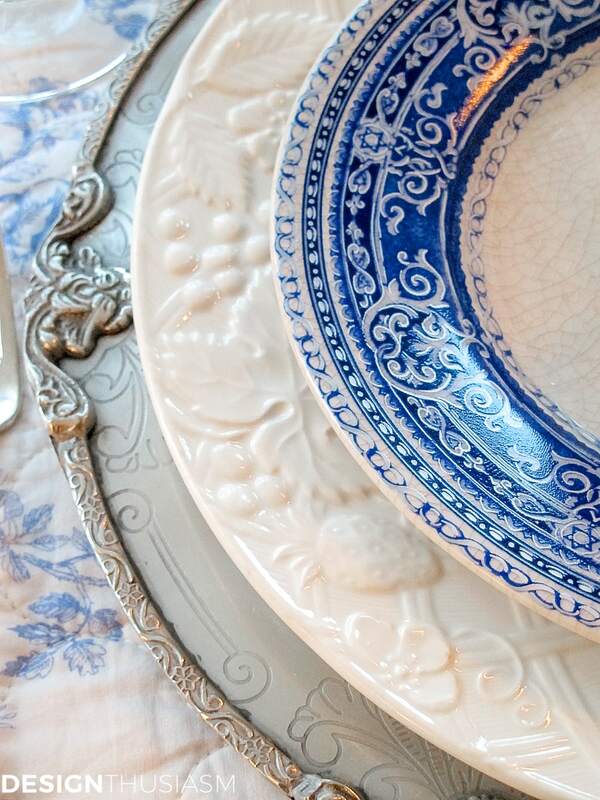 A closer look at the plate stack reveals the detail in the patterns. The chinoiserie vases were ordered online (I’ve linked similar ones below). The color match is perfect and their small delicate silhouettes add color without overpowering their surroundings. A favorite purchase from last year were these dreidel inspired salt and pepper shakers. 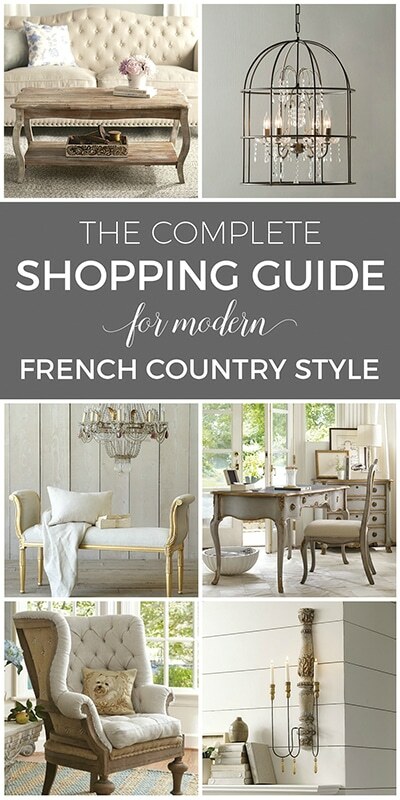 The whitewashed bench complements the relaxed country theme and the toile chinoiserie pillow is the quintessential accent. The glen plaid crystal wine goblets add another touch of pedigree, as they light glimmers off the cut crystal pattern. These are another go-to favorite I use over and over. White embroidered napkins are from my vintage collection and the fabulous blingy napkin rings are originally from Pottery Barn. I bought a set last year but needed to purchase some more, so this year I found these additions on ebay. For my side chairs I swapped out my usual mid-tone wood chairs in favor of these white cane back ones with a French country feel. The homespun pillow was actually sewn together using two very old placements from Ralph Lauren Home. 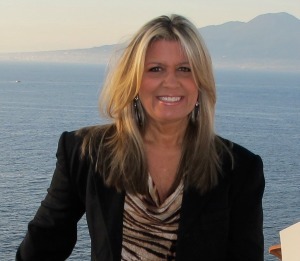 I purchased the placements in the 1980’s when I worked at the company! As the sun set outside my window it cast a blue glow on the scene. It’s beautiful, Lory. Happy Hanukkah! 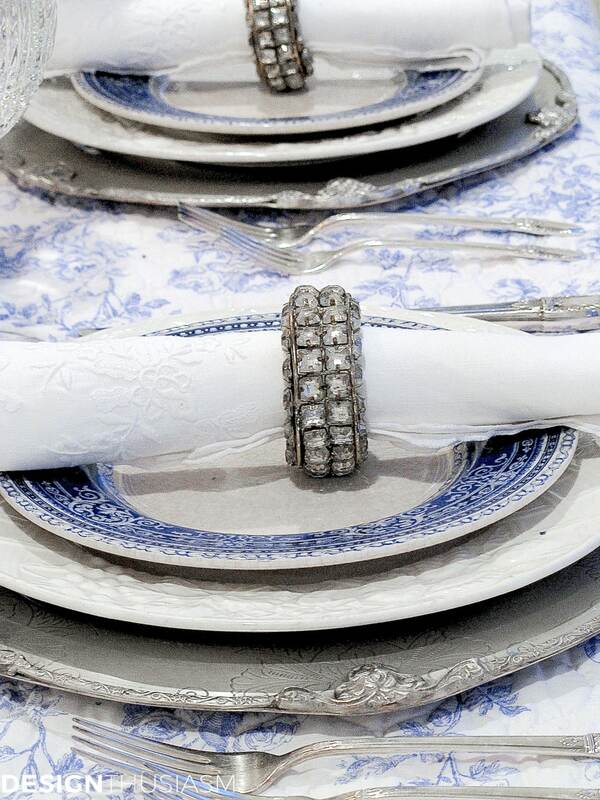 This is an absolutely stunning table…………..love the colors and those star of David plates are simply gorgeous. 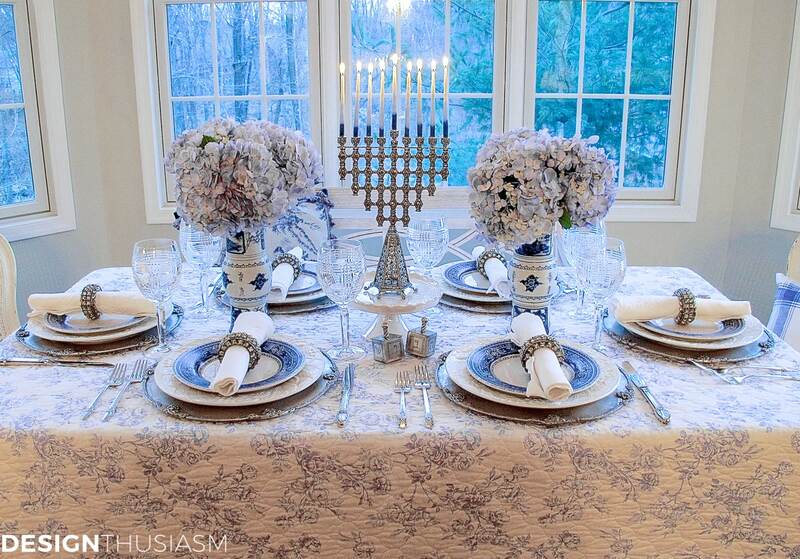 Have always loved the lovely blue tables set of Hanukkah……….so beautiful and so unique. Love blue and white! Most of my own home is blue and white! 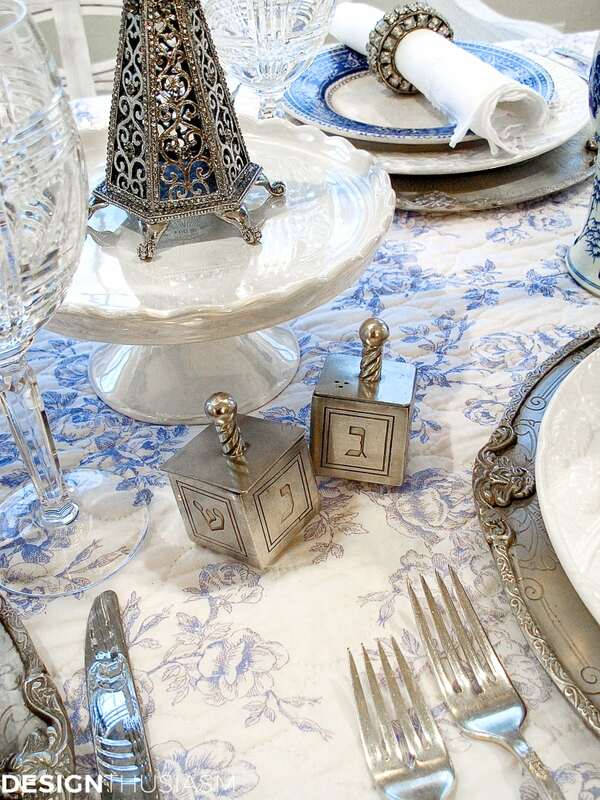 Your Hanakkuh table is gorgeous, especially the Menorah! Thank you, Stephanie! I’m leaning more and more blue and white lately. 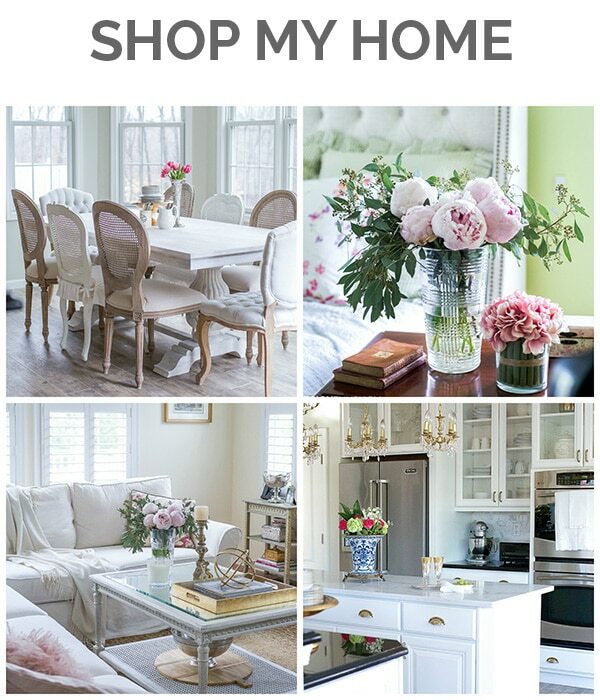 I think it all goes back to an early Ralph Lauren cottage room I remember from the days when I worked there. Having fun with it now… 🙂 Happy Holidays to you!! Thank you so much, Nellie, and same to you!! 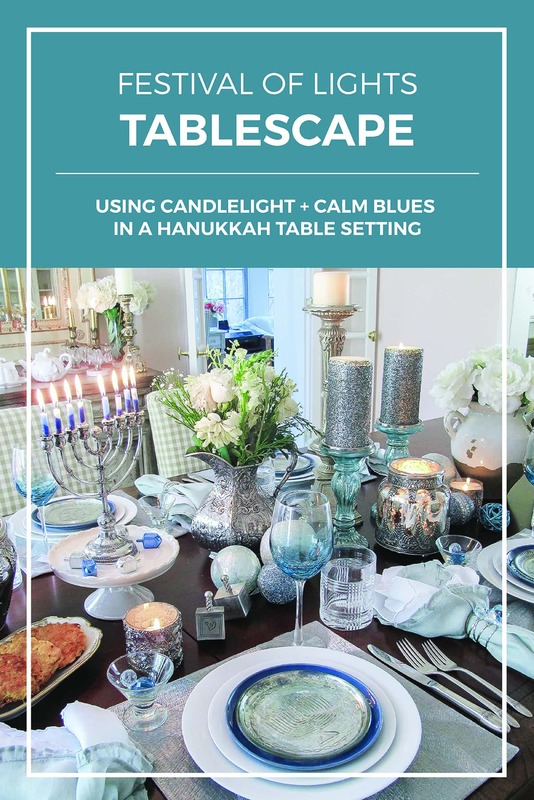 Yes, those plates definitely inspired the whole table… 🙂 It is quite easy to work with blue and white, and lately there have been so many more option for Hanukkah decor in the stores. 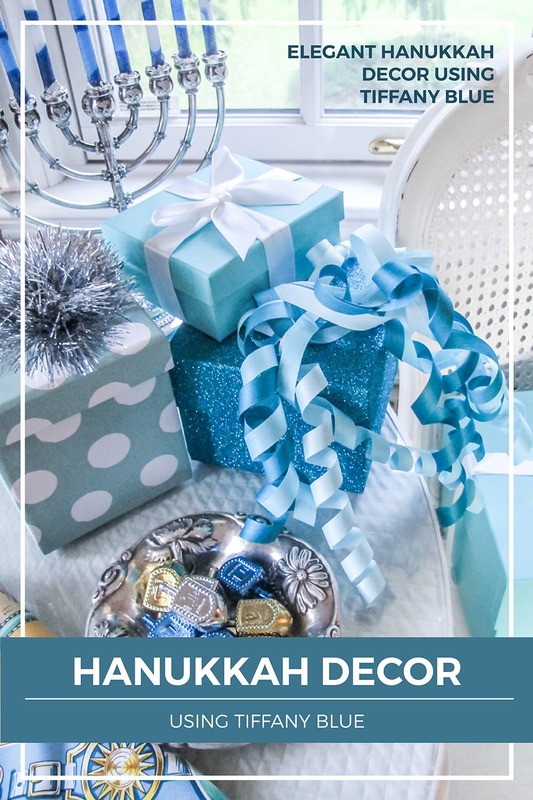 For years it was always hard to find Hanukkah inspiration in magazines or online, since the holiday is in many ways geared for kids, so it’s fun to be able to add to the mix. But I also love the lush richness of Christmas decor, so I’ll have a table coming for that next week! Have a wonderful Christmas!! Oh my goodness, Lory — this table is stunning!! 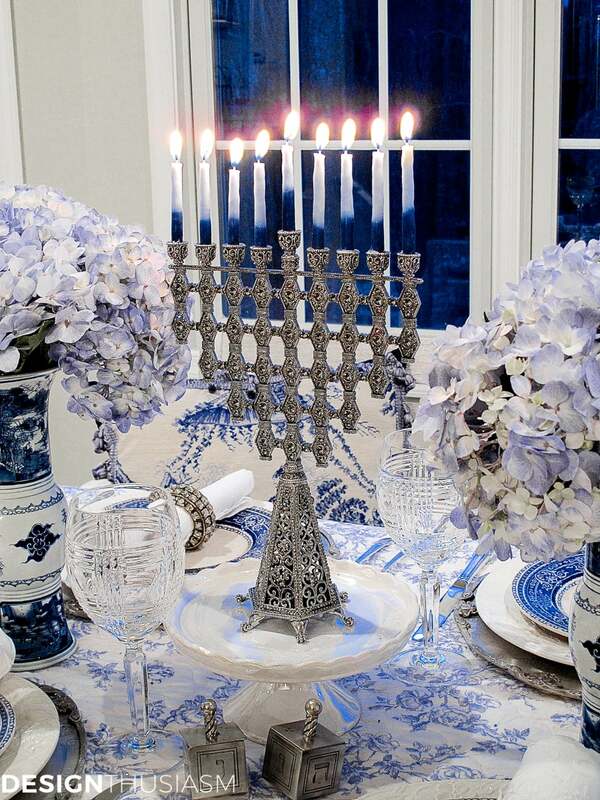 That menorah is amazingly beautiful and every little detail on the table is beautiful, welcoming and special. LOVE it all! Happy Hanukkah to you! Beautiful table, so elegant. I love seeing the blues on the table. I have become a lover of blue and white this year. I don’t have a lot of it but sure an attracted to it. Thanks, Judy! You know, it’s funny, but I never really has a lot of blue and white in my home before either and I’ve been adding more and more lately. 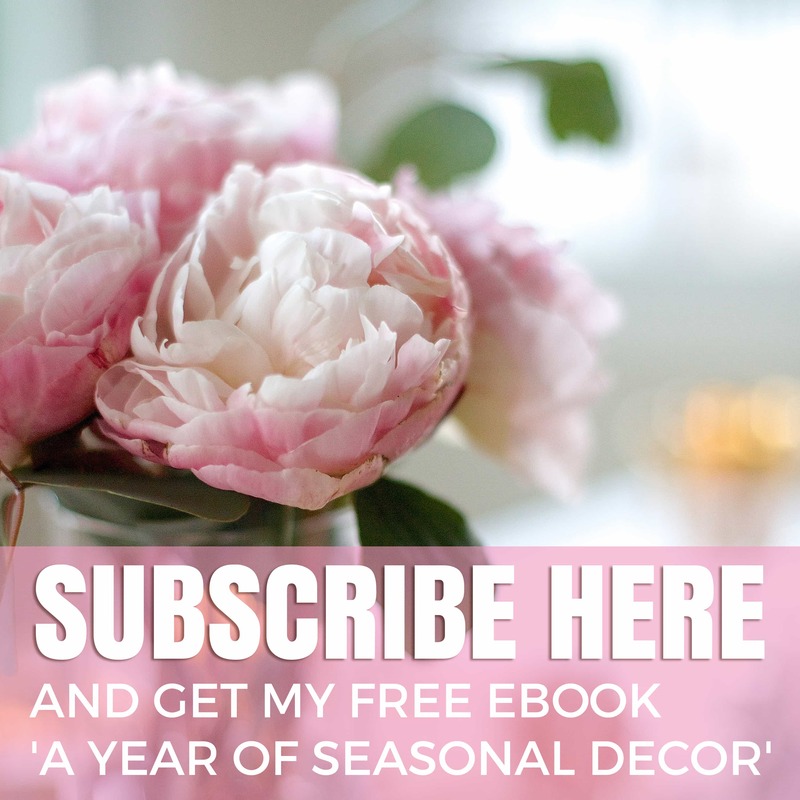 I love the soft and gentle feel which goes with most of my home, but I tend more towards pinks and greens. Having fun with it now, though… 🙂 Thanks for stopping by! Thanks so much, Rosie!! What a lovely comment… 🙂 This one was actually really fun to do and I laughed as I was setting it because I had dragged pieces from all over the house (the quilt was from the guest room, the bench was from the back patio, the chairs were in the mudroom) and I knew hubby would think I was nuts when he came home… lol! Thanks for visiting! 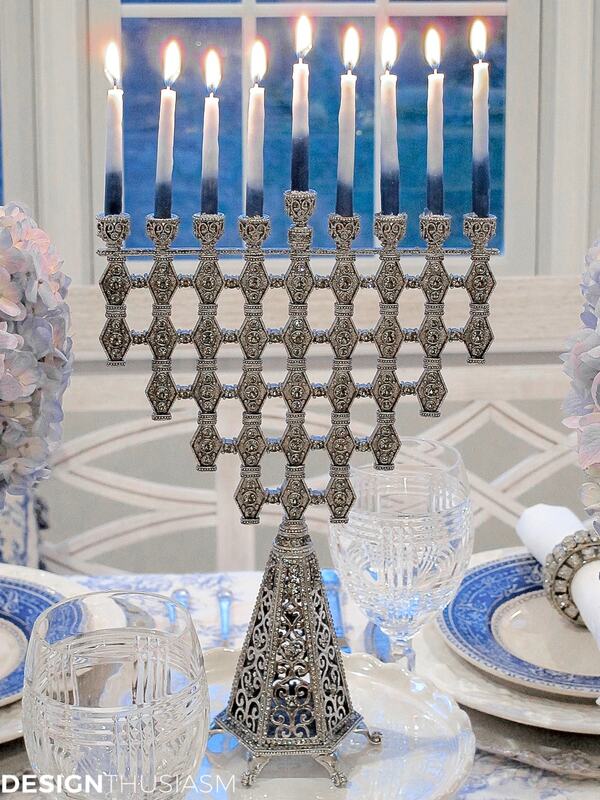 Stunning for any occasion, and your new menorah is gorgeous! All I can say is stunning absolutely stunning! Your table is beautiful! The French blue you’ve used is such a pretty color. This is my favourite of all the tablescapes I have seen. 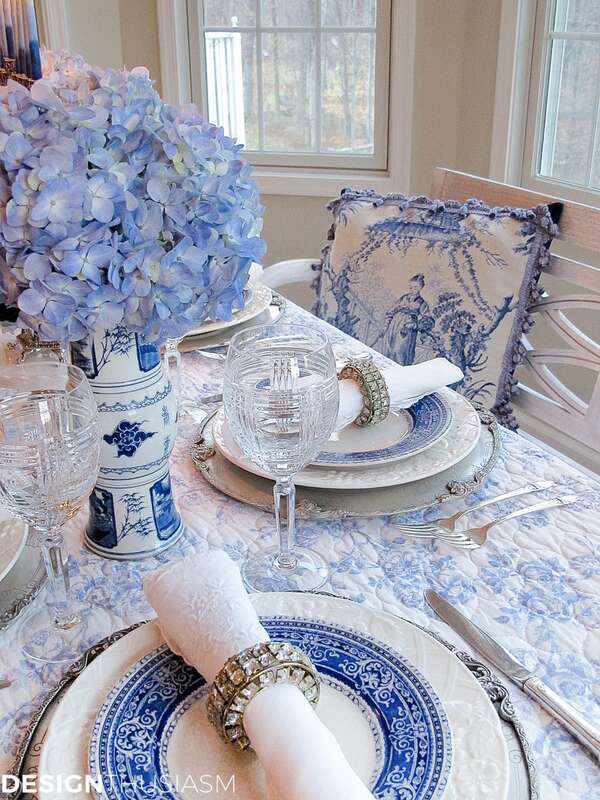 It is lovely, every detail is so charming, the toile table cloth, the cushions, the napkin rings, and everything else. Wow!! Thank you so much, Thelma! What a lovely thing to say… 🙂 Thanks for visiting!! Whoa! That menorah! Everything is beautiful, Lory, but that menorah . . . So, so beautiful! On another note, I, too, end up going back to eBay all the time to buy more PB pieces. I’m getting to the point that whenever I fall in love with something, I’ll double the amount automatically just to save myself some heartache later when I want more but the item is no longer available. That menorah . . . Thanks for the kind words, Maria! I’m glad the beauty of the piece was able to translate in a photo because I was afraid I couldn’t really capture it. As for the PB pieces, yes, I’ve always tried to buy 12 of everything from the start, but when you’re buying so many other things, it’s not always possibly. That’s when ebay really comes in handy… 😉 Thanks for visiting!! 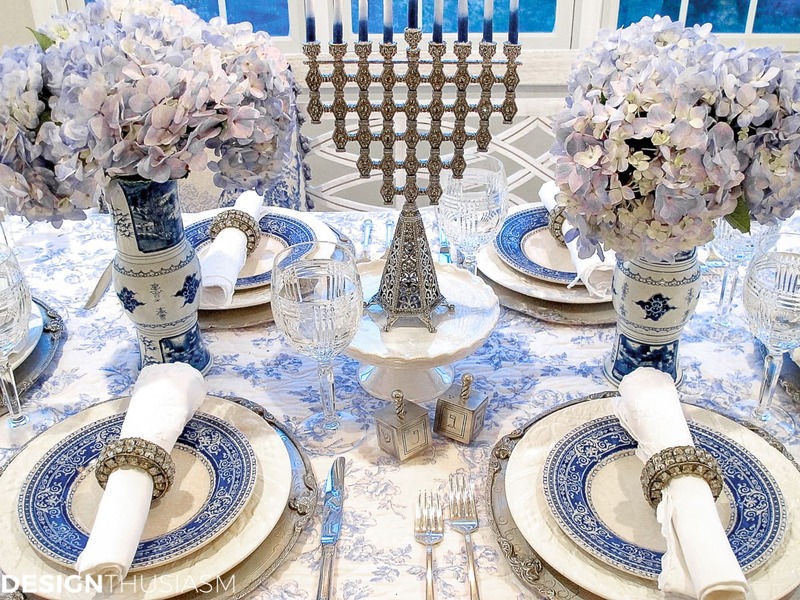 Be still my heart…this blue and white theme is gorgeous, and that menorah…WOW! Beautiful setting, Lory. Sorry I am so behind in replying to your lovely posts, but we do a lot of traveling over the holidays which makes it difficult to keep pace. My belated happy Hanukkah and a most joyous year ahead. Hugs. Thanks so so much, Bobbi! I always enjoy your comments… 🙂 They keep me inspired to keep at it…lol. Hope you’re enjoying your travels and are having a wonderful holiday season!! Btw, my Christmas table is coming soon… so stay tuned. Merry Christmas! Very beautiful. The menorah is spectacular. I wanted those napkin rings, but I missed the boat! Your table is so put together — I have to save it. Aw thanks, Ellen! Those napkin rings will make another appearance on my Christmas table, so stay tuned for more… 🙂 Thanks for stopping by!! Thanks so much, Randi!! I always enjoy your Hanukkah decor, as well… 🙂 Hope you’re enjoying the season and thanks for stopping by! Your table is stunning! And what a gorgeous Menorah. 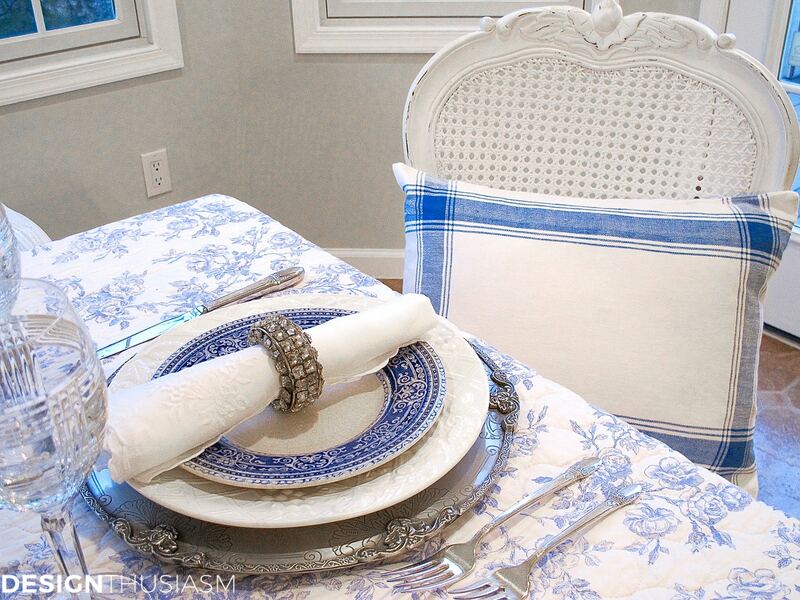 I just love the look of a quilt as a tablecloth and of course blue and white are favorite colors of mine to decorate with. Your guests will feel extra special to sit at this table! Lory, absolutely stunning table! The menorah is gorgeous! The addition of the Ralph Lauren nuances….brilliant! So elegant. You do the most stunning tablescapes. 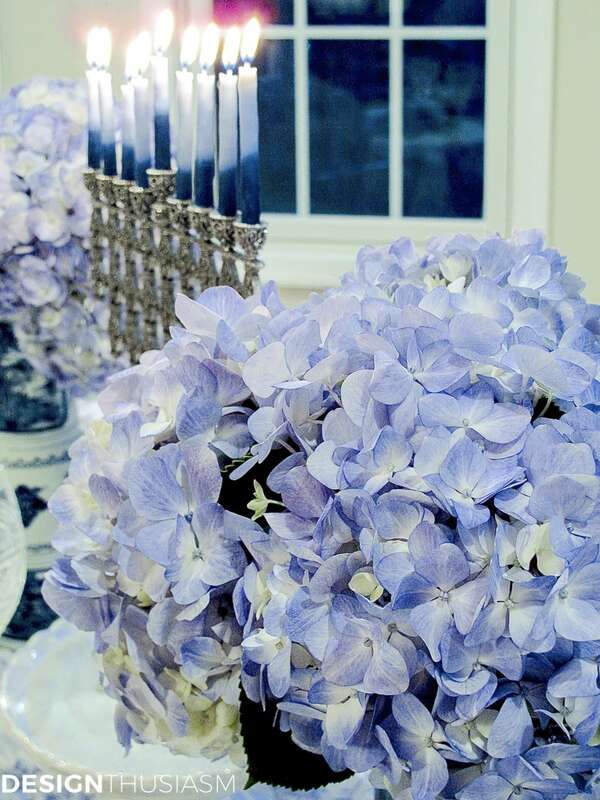 Love the elegant napkin rings and the Hydrangeas are breathtaking! Thanks for sharing with SYC. I love this!!! I am a real “freak” for cobalt blue and white, with accents of pink or yellow!! I could easily live with this color scheme! where did you ever find that menorah?! I found it at a local shop in NJ called CBL Fine Art. Todah Rabbah! it is beautiful! The decor in this room is stunning…I’m not jewish, but the elegance of the menorah alone takes the room beyond the ordinary. Everything is perfectly suited for celebration. I first looked at your designs because toile sometimes has designs of Cavalier King Charles Spaniels worked into the designs. Ironically, I have blue and white transfer ware with Cavaliers, and blue and white toile, I’m getting ideas on how to use. Your designs bring to mind the talented Charles Faundry (I hope I spelled his name correctly). I love the way that you used to decorate it. Really love it. Unique idea and beautifully arrange the things on the dining table. Thanks! As always what a beautiful table setting … You are the bomb!!! !